Sandwich signs are great for putting on the sidewalk in front of your business. They drive traffic into the store, that’s for sure. We like the plastic Signicade type of sandwich sign like the one shown. You can put a coroplast or sintra sign on one or both sides, and they are easy to replace if you want to change your marketing message. You can write on either material with a wet erase marker, so if your sandwich sign is advertising a daily special that’s easy to do. These sandwich signs also can be filled with sand to add weight, making them less likely to blow away in a wind storm. 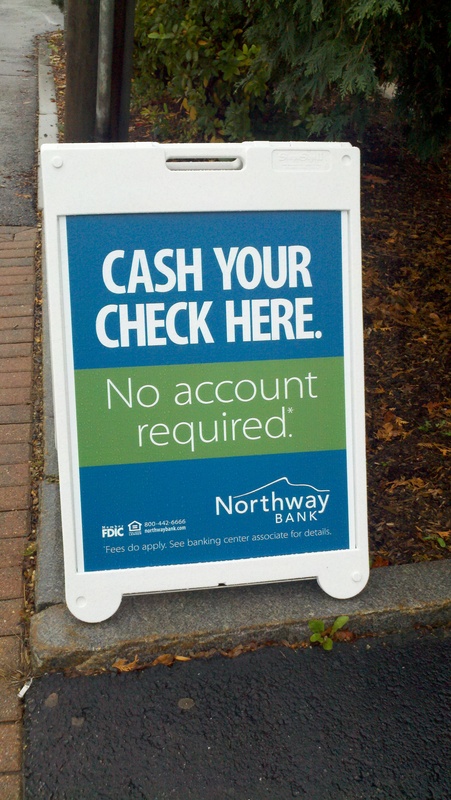 Single sided sandwich signs like this are about $120, and figure $160 for double sided. This entry was posted in large format printing and tagged sandwich signs, sidewalk signs, store signs. Bookmark the permalink.